As temperatures surpass 68 degrees F, research shows that young dairy calves require more efficient levels of energy and protein. The right seasonal diet can help calves convert nutrients to lean gain with greater efficiency. 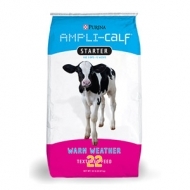 Research shows, when compared to the previous formula of AMPLI-Calf® Starter feed*, AMPLI-Calf® Warm Weather Starter feed can improve overall gain & average daily gain. Click here for guaranteed analysis and more information. Purina® Calf Growena® Feed boosts early rumen development and helps to speed growth. 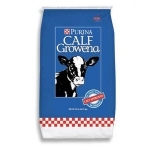 Purina® Calf Growena® is balanced with protein and energy for earlier freshening which provides overall savings. Feed Calf Growena® from 2 months through 6 months of age. 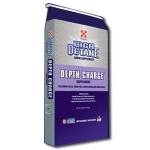 High protein, high energy, vitamin and mineral fortified. Promotes rumen development with excellent performance. Click here for guaranteed analysis and more information.